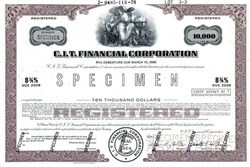 Beautifully engraved specimen certificate from the C.I.T. Financial Corporation printed in 1978. 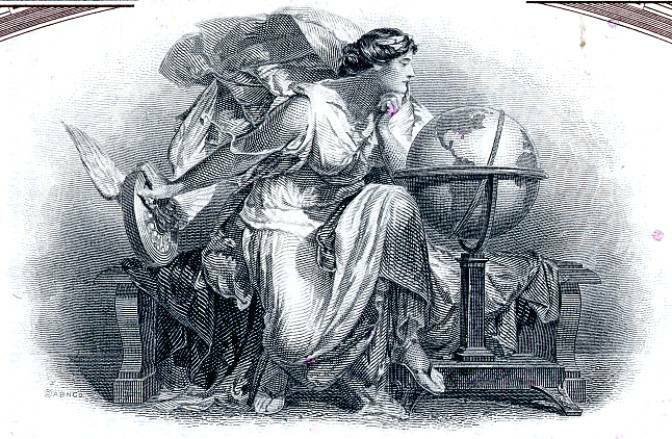 This historic document was printed by the American Banknote Company and has an ornate border around it with a vignette of an allegorical woman in deep thought. This item has the printed signatures of the Company’s Chairman of the Board, and Secretary, and is over 33 years old. CIT Group, Inc. is a large American commercial and consumer finance company, founded in 1908. The company filed for Chapter 11 bankruptcy in 2009. The company is included in the Fortune 500 and is a leading participant in vendor financing, factoring, equipment and transportation financing, Small Business Administration loans, and asset-based lending. The company does business with more than 80% of the Fortune 1000, and lends to a million small and medium businesses. It was a part of the S&P 500 Index, was replaced by Red Hat at the close of trading July 24, 2009. The company has its headquarters in New York City, and employs more than 7,300 people in locations throughout North America, Europe, Latin America, and Asia Pacific. The company's name is an abbreviation of an early corporate name, Commercial Investment Trust. In 2008, CIT Group became a bank holding company in order to qualify for, and ultimately receive $2.3 billion in Troubled Asset Relief Program (TARP) funds. It declared Chapter 11 bankruptcy on 1 November 2009, and with the consent of its bondholders proposed to quickly emerge from bankruptcy court proceedings. In 1908, Henry Ittleson founded the Commercial Credit and Investment Company to help fuel the growth of a rapidly-expanding nation. Ninety-plus years and several name changes later, The CIT Group is now stronger than ever, with managed assets of over $50 billion and 11 consecutive years of increased earnings. The following is a timeline detailing the evolution of the CIT Group, from our inception in 1908 to 1999's acquisition of Newcourt Credit Group Inc.
1908 CIT was founded as Commercial Credit and Investment Company by Henry Ittleson in St. Louis (initial business efforts were in financing receivables). 1915 Company moved its headquarters to New York City and changed its name to Commercial Investment Trust with the identifying initials "C.I.T."
1915 CIT signed an agreement with Studebaker for nationwide wholesale and retail financing of automobiles. This was the first automobile financing program in the U.S.
1920 CIT began to build its industrial financing business alongside its consumer business. 1924 CIT went public and its stock was listed on the New York Stock Exchange. It issued its first annual report. The company had 600 employees and assets of $44.7 million. 1942 CIT Financial Corporation, the company's industrial financing entity, was incorporated. 1933 The company acquired Ford Motor Company's financing arm, Universal Credit Corporation. 1964 Several CIT owned factoring companies were merged to form CIT's Meinhard-Commercial Corporation. William Iselin & Co. was another CIT factoring organization at the time. 1969 CIT began its withdrawal from the automobile financing business. The company refocused energies on industrial equipment financing, factoring and leasing. 1984 Manufacturers Hanover Bank purchased CIT from RCA. 1986 The company officially changed its name to The CIT Group. 1987 Albert R. Gamper, Jr., sector executive vice president of Manufacturers Hanover, was named chairman and CEO of CIT. When Dai-Ichi Kangyo Bank purchased 60% of CIT's stock in 1989, he was named president and CEO of CIT. 1988 CIT sold its consumer loan businesses. 1989 Dai-Ichi Kangyo Bank acquired 60% of CIT from Manufacturers Hanover. 1991 CIT acquired Fidelcor Business Credit Corp. and renamed it CIT Credit Finance. 1991 CIT's new equity investment unit, founded a year earlier, made its initial investment. 1992 CIT Consumer Finance was started 'de novo' to offer home equity loans, returning CIT to the home equity loan business. 1992 CIT Venture Capital became a licensed Small Business Investment Corporation. 1994 CIT acquired Barclays Commercial Corp. and merged it with its commercial services unit to create the largest factoring organization in the U.S.
1995 Dai-Ichi Kangyo Bank acquired an additional 20% of CIT from Chemical Banking, the successor company to Manufacturers Hanover. 1995 The CIT group ended the year with a record $17 billion in assets, reached the $225 million mark in earnings and employed approximately 2800 people across the U.S.
1996 Chemical Bank merged with Chase Manhattan. CIT ownership is 80% by Dai-Ichi Kangyo Bank and 20% by the Chase Manhattan Corporation. 1997 CIT launched an initial public offering of 20% of CIT's common stock to acquire from The Dai-Ichi Kangyo Bank, Limited its option to purchase the 20% interest owned by the Chase Manhattan Corporation and to exercise such option. CIT once again lists its stock on the New York Stock Exchange ("CIT"). 1998 CIT completes a successful secondary stock offering, reducing DKB's stake to approximately 44% with the balance of the shares owned by the public. 1999 On January 28, 1999, CIT reports record earnings of $338.8 million with more than $26.2 billion in managed assets. On March 8, 1999, CIT announced it will acquire Newcourt Credit. On November 15, CIT completed acquisition of Newcourt. In 1999, CIT acquired Toronto-based Newcourt Credit Group Inc. for approximately US$4 billion to create one of the largest publicly-owned leasing companies. CIT over-paid for Newcourt, and merger integration troubles forced CIT to draw upon emergency credit facilities with several banks to avoid bankruptcy. As other funding sources dried up, CIT was forced to sell itself to Tyco International Ltd. in June 2001. CIT became the principal operating subsidiary of Tyco's Tyco Capital business. CIT's Livingston address was changed to 1 Tyco Drive. Tyco ran into its own operating troubles and sold or spun-off non-core opeerations, including CIT. On July 8, 2002 Tyco completed its divestment of its Tyco Capital business through an initial public offering IPO, via the sale of 100% of the common shares in CIT Group Inc. As an independent public company, CIT changed its Livingston address to 1 CIT Drive from 1 Tyco Drive. CIT moved its global headquarters back to New York City, opening a brand-new headquarters in 2006 across from the New York Public Library. Its headquarters were last in New York city in 1983. CIT retained its Livingston campus as its corporate headquarters. On July 1, 2008, CIT Group announced that it will be selling its home lending division to Lone Star Funds for $1.5 billion in cash in addition to the $4.4 billion in debt the company currently holds. CIT will concentrate on its commercial pursuits due to the decline in housing and mortgage markets of the past year. They also plan to sell their manufactured housing portfolio Vanderbilt Mortgage and Finance Inc. for approximately $300 million, although it holds a value of $470 million. In 2008, CIT Group became a bank holding company in order to qualify for, and ultimately receive $2.3 billion in Troubled Asset Relief Program (TARP) funds. On July 13, 2009, Bloomberg TV reported that CIT was asking for FDIC loan guarantees. On July 15, the common stock of CIT was halted on the NYSE during trading hours with "News Pending". At 6:03 p.m. a press release was issued on the company's website[page needed] stating that talks of a government bailout was unlikely. The company had been advised that "no appreciable likelihood of additional government support being provided over the near term." CIT announced that it believed it was unlikely that it would receive further funding from the federal government, and CIT Group came very close to declaring bankruptcy. It was rescued in a US$3 billion deal on 19 July 2009, via an agreement with the bondholders group, which included Pacific Investment Management Company (PIMCO) and some other top CIT holders. On July 20, 2009, CIT Group escaped bankruptcy by securing a $3 billion loan from bondholders, and said it plans a comprehensive restructuring of its liabilities. On September 30, 2009, in its continuing struggle to avoid banktruptcy, CIT Group was reported to be in negotiations with Citigroup Inc., Barclays Capital, and its bondholders to secure rescue financing to comply with its filing to find a plan “acceptable” to the majority of a bondholder steering committee that provided it with the emergency cash by Oct. 1. On Sunday, 1 November 2009, CIT Group filed for Chapter 11 bankruptcy protection. It filed in the United States Bankruptcy Court for the Southern District of New York along with CIT Group Funding Company of Delaware LLC. The history was obtained Wikipedia and OldCompany.com Stock Research Service.